The Marine Conservation Society’s (MCS) launched a Good Fish Guide app in February 2016. Users search an alphabetical schedule of fishes - listed by their common name. They instantly have a quick answer thanks to traffic light graphics. (Red - avoid, Orange - think, Green - choose). If the user wants detailed consumer advice, they simply click on the fish name. The pocket guide effectively serves as an index of UK endangered fish. Now the free App is the 2016 Gold Winner in the 'Digital Food and Drink' category of the prestigious London Design Awards. These awards recognise creativity and leading design across a range of categories. The App project was funded by Compass Group UK and Ireland (UK's largest food and support services firm) and the People’s Postcode Lottery, with the geek work provided by Brightec. (A Brighton based mobile app development company). 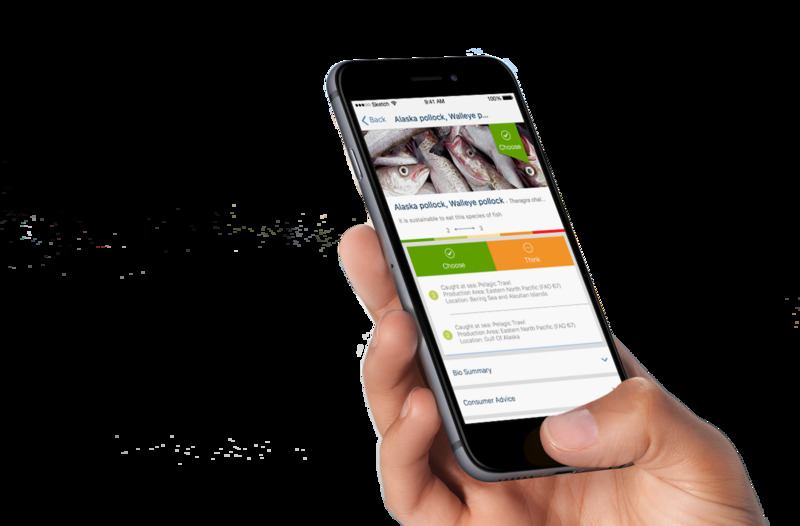 “We believe the 'Good Fish Guide' app is not just an excellent iOS & Android app but also an important tool in the fight for sustainability." The app doesn't just list fish. There are regular contributions of new seasonal seafood recipes from top chefs and celebrities. And a size guide is also included, helping users to spot immature fish that are being sold. Diners can also find restaurants that claim to have great sustainable credentials on an easy-to-use map. You can download your copy of the Good Fish Guide App on iphone and android at www.goodfishguide.org .